Google has added in-app subscription to it’s Google Play Store. Google in this case is caring about developers and this is will give a boost to developers who want to offer subscription based apps for their audience. 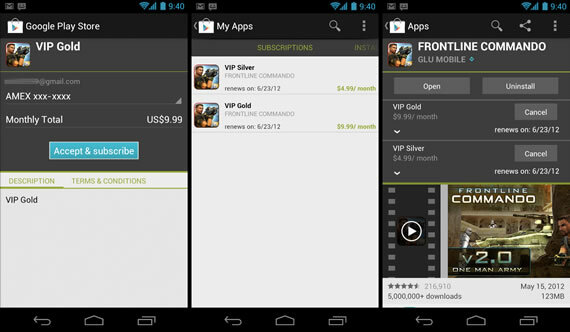 Google Play store added in-app billing more than a year before and today they expanded it with in-app subscriptions. Developer use In-app billing to offer virtual goods or level upgrades in apps, now with this move they can offer subscriptions to Games, or magazines or whatever they feel that users will pony up for a subscription. Google notes that in-app purchase is far more than the traditional app purchase. Starting today developers can sell subscriptions inside their apps, monthly or annual, and Google will take care of the rest. Of course developers can set their own price, Google Play will manage the transactions. For users Google Play will provide subscription details such as price and billing interval before they make the purchase for transparency and will notify users before each renewal by email. Users can see their subscriptions and will have an option to cancel them at any time. Google will offer an API for developers to extend access to their websites from mobile based on in-app subscriptions purchased on Android phones. If you are a developer and want to participate in the program you can get more information from here.